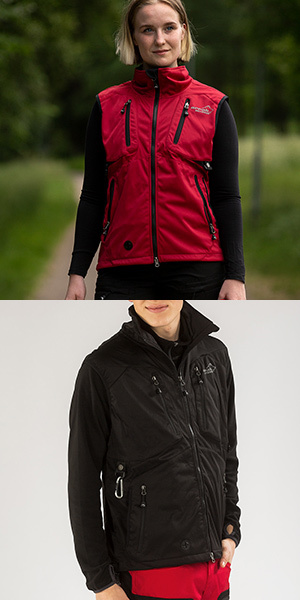 Softshellen Acadia from Arrak Outdoor has several smart features no matter how you use the vest There are six front pockets and a large back pocket. You'll be able to bring your keys, cell phone and possibly a dog in your back pocket. The vest can be adjusted at the waist or at the bottom with a string if you wish for an even better fit. The vest is made of 100% polyester, which is water and wind resistant, and is 4-way stretch. Do you dream about climbing Kebnekaise or Kilimanjaro? Start your adventure with us at Arrak Outdoor. Should you climb Kilimanjaro you will experience several different types of nature and climate. The Acadia vest is a practical garment where you can hang the water bottle in the carabiner for easy accessibility. When it gets colder you can pull up the zipper and it will keep you warm. We can recommend that you buy a Buff that you can put around your throat or head when it gets cooler. As a dog owner, there are several smart solutions on the Acadia West. You have the big back pocket where you can put the dog-knot if you would like to practice or compete. If you are on a morning walk or evening walk, you can put the dog bags in your pocket and use the dog bag dispenser to easily get new dog bags. The Acadia vest is available in a unisex model and a women model, but we are working on picking up more colors for the collection. See the Acadia collection. If you have questions about our west or any other product, we would like, you to contact us and we will assist you.